Creamy tuscan white bean soup, with roasted garlic and a touch of sage. So simple and inexpensive to make, and so so good. Leftovers can be frozen. I love coming back home to a hot slow cooked meal, a few other crock pot favorites are Brown Sugar Baked Beans, Chickpea Sweet Potato Stew, and Navy Bean Bacon and Spinach Soup. Place remaining garlic cloves in the center of a 7×7 inch square of aluminum foil (photo above is showing half of the cloves, use the whole thing). 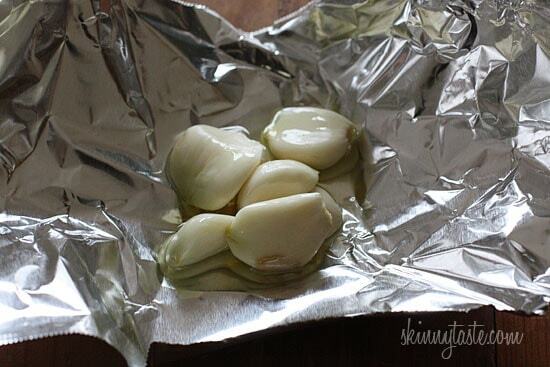 Cover garlic with olive oil and a little salt. 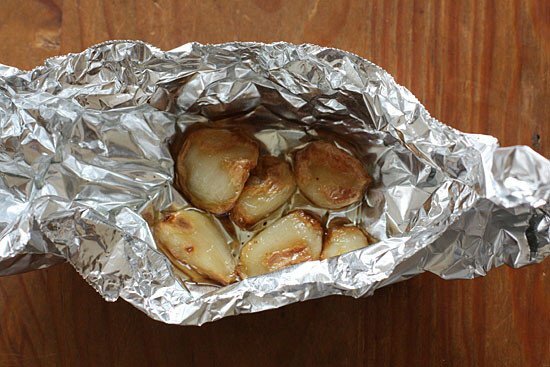 Seal aluminum tightly and place in the oven 25-30 minutes, until garlic is soft and golden. Remove from oven and set aside until the beans are done. When the beans are soft, add the bouillon and mix well until dissolved, then carefully transfer some of the beans and liquid along with the roasted garlic to the blender. Blend until smooth and pour it back into the crock pot. Repeat with the remaining beans until you get the texture you desire. You can also use an immersion blender if you have one. What would be a good way to go about this using an instapot? I am new to all the instapot cooking and would love to try this. I failed numerous times making it in the crockpot. How much water should I use if I use canned beans? Thanks so much! LOVE your recipes! Do you use the Better than Bouillon ‘straight’ from the jar or do you follow their directions and put it in boiling water? I have made this numerous times and I love it! Most recently, I was lazy and didn’t feel like roasting the garlic. While it is still delicious, the roasted garlic is a HUGE difference-maker! Don’t skip this step!!! I grew garlic this Summer and had a bountiful harvest. I was looking for something other than pesto (which I will also be making) to use the garlic for, and ran across this. Looks great. But I’m going to live life on the wild side and make it with black beans. No guts, no glory. Oooooh … black beans! What a great idea! Made this over the weekend and it was sooo good! I actually ate a bowl of it straight from the slow cooker with the ladle. Who needs a spoon?? I used Great Northern beans because I wasn't sure if my crock pot boiled while on high (it does!) so just wanted to be safe. Also since the beans are smaller I only used 6 1/2 cups of water. It came out very thick so I could probably increase to 7+ cups next time. I also added about a teaspoon of cayenne pepper at the end to give it a little kick. I am making this with a small crockpot (2qt). Hoping it turns out! Hi. I made this soup yesterday in the slow cooker. Came out great. I used great northern beans. I added salt and pepper once in bowl, but that's my personal preference. Just delicious. Thanks. I made this today using a pressure cooker. I'm a garlic fanatic, so I think I should have used another head of garlic too add more flavor. I did eat a few cloves after I roasted them. Haha. It still came out really good. Simple yet delicious. Gina – OH. EM. GEE. I canNOT get over how good this is! While I was separating servings for the freezer and heating some up for dinner last night, I kept licking my fingers and saying out loud, "mmmm MMMM!!!!!" Thank you for an amazingly easy, filling, tummy-warming soup! I only use dried beans for a few reasons, a big one is sodium which is added for preserving the shelf life, cost is way less with dry & yes they're a bit more work, but worth it. I have a newer pressure cooker from start to finish it's 30 min., I do freeze the beans in batches, so there ya go…also yes, you can freeze soup & other dishes you make. I prepare rather huge amounts of almost everything & freeze it in batches, made homemade chili froze it servings for 4…that way if your having double that just grab 2, or freeze 2 person depending on your family size, or lifestyle. 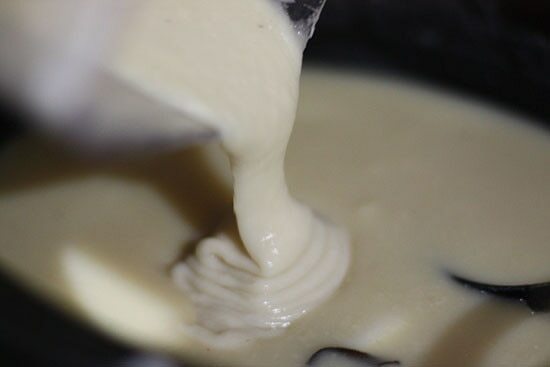 I also find that if you hold off adding all your liquids until almost the finished product you'll have more control over the thickness/thinness, It's my experience that most all soups tend to need fluid added the next day. I also try to make my own stock/broth (they are really the same) it's not as much labor as you may think…veg broth is as simple as throwing cleaned stuff that you cut off while your preparing those yummy veggies; add herbs that you like, after all you're the one who knows best what you want to taste in future dishes…also you can (I do) make a "bouquet garne" it's French for bundle your herbs drop them into the stock pot, but using cheese cloth tied with cord will give you an easier option then there's a cleaner look & taste to the final results, especially if you aren't using all fresh herbs! I've gotta say I love fresh everything, but am not going to run to the store for one, I've got a very well stocked spice shelf & have no problem grabbing a few to elevate a dish. After your goodies cook a few hours adding water, strain out everything…you then will have your own, that you know EXACTLY what's in it stock/broth & you can freeze it or put it in the fridge for I would guess like a week. Chicken & beef really just left over from a whole hen or buy inexpensive cuts of whatever is available to you & boil also you can roast it for awhile then boil, the flavor will transfer to the pot liquid, add veg scraps to your stock & cheese cloth of herbs…your a rock star, experiment, everyone who's a great chef starts out not knowing what they're doing…the best part about making stuff from scratch is that you know exactly what's in it…and that would be my GIANT reason why I prefer to do the work! Read the ingredients on everything you buy…then read between the lines because there's a whole lot they aren't telling you, blessings. I found a no salt added, no MSG chicken bouillon at a local bulk food store. (Sorry, no brand name available.) I use it all the time and the flavour is wonderful. I'm looking forward to making this soup (and so is my dietician!). Hey Gina! This soup looks fabulous, I'll be making it for my family for dinner tonight. Please keep your recipes coming! I was looking for good healthy recipe blog, and I'm so glad I discovered your site. Hi! This sounds amazing. I was actually wondering how this freezes. Is there anything I would need to do different? Also I noticed that someone mentioned that they didn't have sage so they used dried herb de Provence if you were going to use this instead how much would you use? Thanks soooo much! Great recipe. Used Trader Joe's reduced sodium condensed chicken broth packets (2) with a garnish of Trader Joe's uncured applewood smoked bacon. How many cans of beans do I need to use in order to end up with the same serving size? I made this soup for my finnicky husband and he absolutely loved it! Amazing recipe! I used canned northern white beans on the stove and it turned out perfect. I just made this soup last night! I added a touch of cinnamon and lemon juice just to add a little zing. Super good, and crazy easy. I already had veggie bouillon, salt, and pepper so the rest of the ingredients cost me only $3.50 at the grocery! If I'm using canned beans, how much water should I use? This looks absolutely delicious! We are on a huge soup kick right now trying to stay warm in the deep freeze. 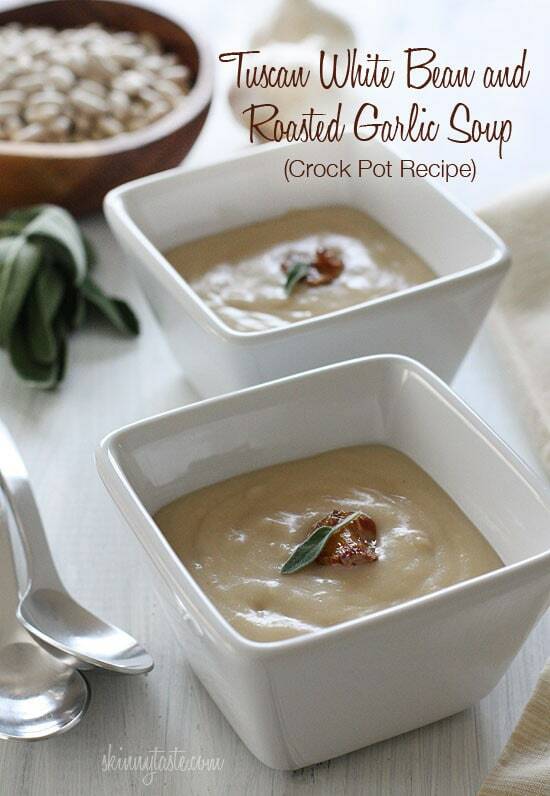 LOVE white bean soup and the roasted garlic sounds like the perfect addition. I made this last night and had it for lunch today. It was excellent. Here is what I did – let the beans soak overnight – I had the time so thought I might as well. Used 6 1/2 cups of water after hearing other reviews. I didn't have fresh sage, so I used dried Herbs de Provence and it was very very good. Otherwise, followed the recipe to a "t". Today I topped it with a bit of kosher salt and chayenne pepper. I see many comments about their soup being too watery or too thick. It's not because of the recipe. It's the beans. Different beans absorb different amounts of water. The age of the beans influences water absorption too. Since you can use any white bean you'll have to adjust the amount of broth or cooking time as you go. Adding broth with salt in it will slow or even reduce water absorption and make the beans tough and less flavorful. Canned beans won't have this problem since they're already cooked but they cost more than using dried beans. This is an excellent and healthy recipe. Adding spinach (or kale,mustard or turnip greens) or sliced mushrooms adds more variety. No limits on this dish. Try something and see if you like it. I am making this now and so excited…one question. The sage and the garlic that we boiled…should those get pureed as well? I know we can if we want but I am not sure if it would be too much sage and garlic … Thanks! Just made this soup and it's fabulous! I used navy beans and a little more garlic and sage (because I'm just that way) but otherwise followed the directions exactly. So flavorful and so easy! This site is so great… I've tried a couple of recipes and have a ton more on my list to try. Thanks! 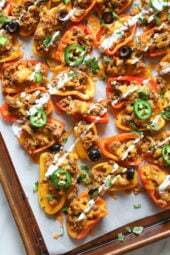 I made a few recipes from your blog and my family enjoyed a lot of them. I used great northern beans for this recipe and would not recommend. The taste wasn't pleasant even though the texture was just right. Perhaps I'll try again with the Cannellini beans as the recipe suggests. The soup was a little more watery than I thought it would be. Also, I think I need to cook the beans a little longer. After I pureed it with my immersion blender there seemed to be teeny-tiny 'bits' that were beans that seemed chopped rather than pureed. It seemed a little bland too. I did not call it a loss as an overnight in the fridge can give a chance for flavors to develop. Today it was a little more flavorful and thicker. I think it would benefit from a squeeze of lemon. I might try again with more sage and garlic. Is it a problem to cook it on high for more than 4 hours? I'd like to make this for dinner one night but I can't come home in the middle of the day to turn the crockpot on. I saw the comments about not cooking it on low, so I thought maybe it could just cook them on high for 8 hours? I made this soup last night and I had the same problem with it being too watery. I ended up draining out the beans, adding a bit of the liquid and pureeing it. The flavor was okay but I think it lacked richness because I had to drain out the liquid and lose all the bouillon flavor. I'll try it again with less water to cook the beans in. I made this soup today and it came out great! I made some changes though that I thought some people may. I made it on the stove top may be helpful to some. I used 4, 15oz cans of beans. Because the beans are already cooked(and would not absorb the water), I reduced the amount of broth/water to 6 cups instead of 8, and the consistency was right. 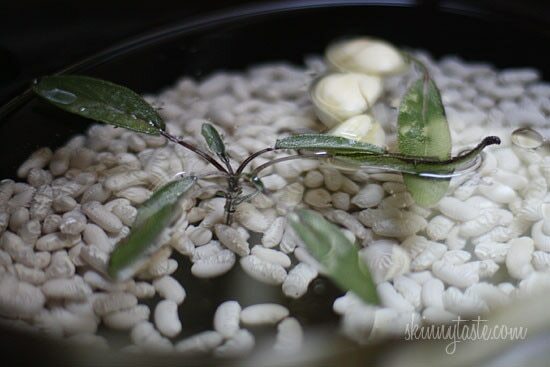 Just bring beans, broth sage and garlic to a boil and simmer for 15 minutes before pureeing. To increase the veggies I added wilted spinach and diced roasted red peppers as well. It was delicious! If I put the beans on before I left for work, would they be ok on warm for 8 hours? Or do you have another recommendation for a longer time in the crock pot? I have the same Hamilton crock pot Gina does. Loved the flavor of this soup. The roasted garlic and white pepper really give it such a nice flavor. Mine came out rather thin as well..but definitely worth a second try with extra beans or less water to thicken it up for me. I wonder if it is due to the crockpot temp variances..some steam more leaving less liquid? This soup looks delicious! Made it tonight and it didn't turn out how I expected though, which was disappointing. Mine didn't turn out anything like the picture above, and I wasn't a fan of the flavor or consistency 🙁 Totally sad since I absolutely love a nice bowl of soup! Anyone know how many cans of beans would be the equivalent of 1lb dry beans? I just made this with canned white kidney beans and added some crushed red pepper for some heat and some dried basil to it along with a lot more garlic than the recipe called for. It tastes amazing! I absolutely love it! I made the soup with Great Northern Beans. It was Awesome and so easy to do. Thank you. I've been wanting to incorporate more beans into our diet. This is an excellent way to do it. Awesome recipe !!! I'll definitely spread the word on http://www.crockpotking.com! Please whatever you do please keep it comin as far as the recipes. Strange, mine was so thick. My blender is really strong, wondering if that matters? Did you use Better 'n Boullion? I can't see how it was bland if you did. I'm surprised. I found mine way too thick! The instructions say to add the beans and liquid to the blender, but there was no liquid left in the crockpot. I use it sometimes, it comes in handy at times. Anyone try this with chicken, fish or shellfish added? Any suggestions? Do i take out the sage leaves after the beans are cooked or blend them as well? You can take them out if you wish. I couldn't find sage leaves but I have dried sage in the bottle. How much would you recommend of that? Thanks! This looks so good! I absolutely adore roasted garlic too. I love how you peeled the garlic first as well. I'm going to have to try that for sure. I always feel like I waste a lot of the garlic when trying to squeeze them out of the skins after roasting. I actually can't believe I haven't thought of this yet! This recipe sounds delicious. I went to the supermarket to buy the beans, and saw pinto, navy, limas, but no white beans. It may be that they are not sold in my part of the world (southeastern Virginia)but is there a substitute. I can get canned white (cannilini beans) but no dry ones. Any white bean is fine, go with Navy. I love bean soups so will definitely try this one. Because I now live alone and my dry beans tend to be harder than they used to be, I would probably soak them at least overnight before proceeding with the crockpot. Gina, I buy my garlic at Costco in the plastic container, already peeled and cloves separated. How many of those should I roast for this recipe? I have everything to make this and will be trying it out! Looks delicious! I made this last night, it was so easy and so good. It also made enough for todays lunch. Thank you! What beans can i sub for cannellini? Any white beans will work, I love northern beans. This looks good! 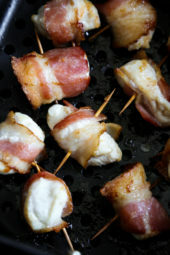 I think I'll try it with rosemary to make it "Tuscan"
I'm going to make this today. I'm going to be adding roughly chopped pimento pepper and spinach after pureeing, but before it's done cooking, to make it something of a Tuscan White Bean Florentine soup. I'll be cooking mine on high. My slow cooker boils at high so that should kill off any toxins. Looks delicious!!! Loving the roasted garlic!! I have NEVER soaked my dry beans before cooking them in my crock-pot and they have always turned out perfect. Being from NC, we always use hamhock for seasoning, thanks for a healthier alternate! As a Hispanic, we too love ham hock in our beans but I usually make them in the pressure cooker! Bouillon, or cube (vegs us vegetable bouillon)?? In the soup aisle, they sell bouillon cubes to add to soups for quick flavor. Better Than Bouillon is a brand I like, google it. BOUILLON CONTAINS LOTS OS SODIUM! The sodium is listed above, it's actually pretty low. Better Than Bouillon also sells a Low Sodium version but the beauty if using theirs is you have control over how much you want to add. this looks warming! i also love the use of the crock pot. 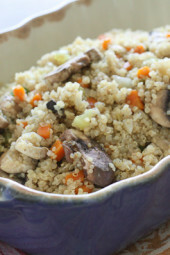 Uses the crock-pot and can be gluten free! I can't thank you enough!!! Roasted garlic and sage sound like a dream combination! This looks so creamy and delicious, not to mention healthy! This soup looks wonderful, but please be aware that cooking dry beans in a slow cooker can be poisonous. Dried beans contain a toxin called phytohaemagglutinin which is usually destroyed if boiled in water for 10 minutes. The slow cooker will not kill off this toxin unless they have been preliminarily boiled. Cannellini (white kidney beans) contain some of the highest levels of this toxin. Is that so? My crock boils on high so I guess that wasn't an issue. We have cooked dried beans in the crockpot many times with no problems. The syndrome is usually caused by the ingestion of raw, soaked kidney beans, either alone or in salads or casseroles. As few as four or five raw beans can trigger symptoms. Several outbreaks have been associated with "slow cookers" or crock pots, or in casseroles which had not reached a high enough internal temperature to destroy the glycoprotein lectin. It has been shown that heating to 80°C may potentiate the toxicity five-fold, so that these beans are more toxic than if eaten raw. In studies of casseroles cooked in slow cookers, internal temperatures often did not exceed 75°C. Depends on the bean. Kidney and cannelloni beans contain this toxin and need to be brought to a boil while cooking. Other beans do not contain this toxin, but check before cooking on low in the slow cooker. so is it ok to boil them for at least 10 min. then put in crock pot? This looks yummy! In a pinch, could I use canned beans and dried sage and just do this on the stovetop? This sounds delicious! Definitely will be giving it a try. Yes you can, but they say you shouldn't cook beans with salt to avoid them getting tough. Maybe what you can do is drain the beans, then add chicken broth and the beans to the blender instead. I did use chicken broth instead if bouillon + water and it turned out fine. No problem at all. this would work just fine in a pot. I would recommend soaking the beans first or using a pressure cooker. But the rest of the steps would be exactly the same. Any tips for those of us who want to make the soup and don't own a crockpot? Soak the beans overnight or using the quick method as instructed on the package, then simmer until tender, same ingredients. you could cook it slow on the stove top covered. Get it up to a boil (on medium) and then cook it on low. After a couple of hours, check and see if they are for soft yet. * You can find a crock pot at a goodwill, saver, etc. If there is no lid, just use foil to crimp around the edges. Looks great, I'll give this a shot. I wonder if I can have this ready when I get home from work if I put the crockpot on low for 8 hours…probably fine, will report back! Hi – please don't cook on low until you read the comments below re needing to soak/boil the beans to remove the toxins. If it is so important why be anonymous?